If you are a professional salesperson, sales manager, VP or CEO this webcast is for you. 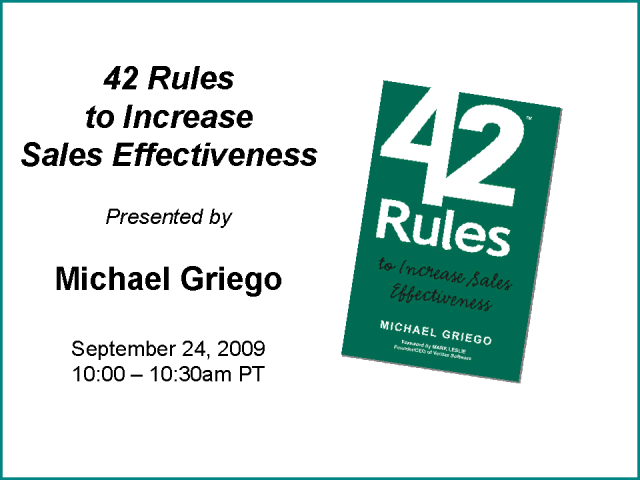 Join author Mike Griego as he shares rules from his new book '42 Rules to Increase Sales Effectiveness'. As a sales consultant and trainer of Fortune 500 firms and leading Silicon Valley firms, Mike has road tested these rules over 28 years of personal sales and management experience and close observation of many salespeople and sales organizations. These rules apply to all selling efforts, from high-tech enterprise sales and non-technology sales. results. Topics include Strategy & Planning, Getting Started, Leading, Managing, and Optimizing resources for optimum results. A book is the best marketing investment you can make. It gives you a platform to grow your business. Everyone who reads your book is a potential customer and there is nothing more effective as a marketing giveaway than a book. Many people dream of writing a book but most people never put pen to paper. Discover the the depth of value a book (or series of books) can create for your business. *Can make you an instant expert. *Can help you build a brand. *Can increase revenue with both new and old clients. *Can help you get speaking engagements. *Can be repurposed into many different types of content. Whether you write the book yourself, have your clients or partners provide content, or have it ghostwritten, you will be informed and inspired by the stories and lessons of others who have had success with books. Mitchell Levy, CEO, Thought Leader Creator, and Publisher at THiNKaha®, has started and run fifteen firms and partnerships since 1997. He and his teams focus is to help turn corporate experts into thought leaders. He is a physical and eBook publisher (225+ titles) and an Amazon best-selling author with eighteen business books including “42 Rules for Driving Success with Books (2nd Edition)”. Mr. Levy is a frequent media guest and a popular speaker. In addition to the companies/joint ventures he's started, Mr. Levy has provided strategic consulting to over 100 companies, has advised over 500 CEOs on critical business issues through the CEO networking groups he's run, and has been Chairman of the Board of a NASDAQ listed company. Have you changed yours? In this recorded webinar, the authors of “42 Rules for B2B Social Media Marketing” will discuss the latest trends in social media and how to use it to advance your company’s goals -- and your career. With over 20 years of combined experience in social media, the authors will share success stories and best practices for mixing social media into your marketing plan, leveraging the top social media channels, and generating leads. Pam Fox Rollin, Author "42 Rules for Your New Leadership Role"
You've said yes to taking over a big complex and failing project for your company. You have to herd cats who don't actually work for you, separate the smoke from the fire and figure out what really needs doing, make frustrated people cooperate with each other, build the support of skeptics and slackers, and somehow achieve a win while you still have executive support, team attention, budget to burn, and a market opportunity worthy of all this hard work. Are you curious, lost, confused or naive about the latest changes with Google Analytics? Look no further. This 42 Rules webinar will focus on the latest features found in the new Version of Google Analytics. You will come away with a better understanding of the tools and features most valuable for your business. The Publishing industry has undergone some significant changes. Join us for the 30 minute webcast with Publisher Mitchell Levy to learn the reasons behind the shift and what it means to both readers and authors. Attendees will receive a free 42Rules e-book of their choice. Do you need a tagline? What about a new logo? Photos or illustrations? Building a brand isn't as easy as it looks. A well designed brand is like a well designed car – lovely to look at, lots of power, and can really take you places. The power of a brand is based on how well it can convince people to buy your stuff. There are countless definitions of what a brand is, and regardless of your definition, if the brand doesn’t help you sell more stuff then it isn’t doing its job. All brands are built with three essential elements: Personality, Message and Identity. Join Laura Lowell as she discusses the specific elements required to develop and communicate your personal brand - Personality, Message and Identity. 1. Asking Permission: getting the customer to give us permission to communicate with them. 2. Addressing Objections: helping the customer overcome their immediate objections to your solution. 3. Building Relationships: supporting the customer's decision making process until the sale is made. Have you achieved your business goals this year? How about your personal goals? If you're like most people you have made progress on some, and left others unrealized. It doesn't take much to get yourself start off on the right track. This webcast is for you if you have a business and haven't been meeting your yearly goals. Join me and let's work together towards a successful 2012! In this economy businesses continue to search for ways to reduce spending and increase profits while still providing excellent service to their customers. Outsourcing their call center is one solution they can and should consider says author Geoffrey A. Best. Attendees to this free webcast will hear Geoffrey share some of the rules that will include practical approaches for planning, implementing, and outsourcing call center operations. Not sure how to make the leap into social media? I'll show you how...one step at a time. From Facebook and Twitter to LinkedIn and Quora, there has to be a method to the madness. Come learn 6 things you can do immediately to take advantage of social media. Join Laura Lowell and hear detailed explanation about how these 6 simple steps will help you build your brand and your business using social media. What makes the difference between websites that win and those that don't? Find out all the details from Philippa Gamse, author of the new book "42 Rules for a Web Presence that Wins". Attendees to this free webcast will hear Philippa share some of her rules that "will help you avoid the pitfalls and potholes," according to Guy Kawasaki, Author, "Enchantment: The Art of Changing Hearts, Minds, and Actions" and former Chief Evangelist of Apple. Don't miss your chance to hear essential business strategy for website and social media success. For most consultants and coaches, your brand is being created with and without you. You need to give people something positive to associate with you and your brand. The hardest part of branding is getting the word out - making sure you are being heard. Social media offers you a vehicle to communicate your personal brand to your audience - if you know how to do it right. In this webcast, learn how to define your brand purpose and clearly communicate it via the appropriate social media outlets. We'll look at what matters to your customers, which platforms they use and how you can use that information to your advantage. Nearly 40% of the world’s production is now in China and it is also the fastest growing middle-class market anywhere. Everyone needs a fundamental understanding of the market for manufacturing and selling because our everyday lives are affected daily by what goes on a hemisphere away. Doing business in China is tougher than you think. Not only is the culture vastly different, but China’s experience in manufacturing is still developing. The best way to quickly come up to speed on these differences and how to handle them is to learn from the experience of others. Join Rosemary Coates to discuss her new book "42 Rules for Sourcing and Manufacturing in China". Writing a book builds credibility and sets you apart in a competitive business environment. In this information-packed webinar, you’ll learn how to decide if writing a book is right for you and the role a book can play in your strategic marketing mix. Laura Lowell, the founder of Impact Marketing Group and author of several books including the Amazon bestseller "42 Rules for Marketing" will share the new rules of publishing, best practices on marketing your book, and how timing can affect your success. You will walk away understanding the impact of Publishing 2.0 on the overall industry and the new publishing options available to you. In her new book, '42 Rules To Turn your Prospects Into Customers, Meridith Elliott Powell draws on her 20-plus years in sales to give you a practical step-by-step guide on how to find the right prospects, build profitable relationships, sell for success, and close more sales. This webcast focuses on key rules Powell has gathered to help you navigate this change, get ahead of the curve, and succeed. There is so much talk about online marketing, passive revenue and the like. The problem is that all of these marketing tactics rely on a really great marketing list. Without the list, nothing else matters. Based on the experiences of Laura Lowell, author of the Amazon best selling "42 Rules of Marketing", this webcast is full of practical and actionable ideas that you use immediately to build your marketing list. Have you ever thought "I could have written that!" Well, maybe you should. Books are one of the best marketing investments you will ever make. Your book gives you instant credibility, open doors and generates direct and indirect revenue. Learn how to apply the 42 Rules of Marketing to help you build your brand and your business with books. Books are tangible, valuable and practical ways to differentiate yourself and your business. After all, have you ever thrown away a book? Overview: To compete for the enterprise budget, vendors are providing more sophisticated and targeted solutions, and looking for ways to increase their relevance to customers. To do so, many are increasing the level of industry alignment within their companies. But how much focus on target industries is enough, and what are the keys to making this investment pay off in incremental revenue growth? Lilia Shirman will share the results of the research for her book, 42 Rules for Growing Enterprise Revenue, and of her company’s recently published 2010 Benchmarking Study on Vertical Market Specialization by B2B Vendors. Learn how vendors align their resources and organization around target vertical markets, and what lessons and best practices can be gleaned from their experiences. All webinar attendees will receive a free summary of The Shirman Group's 2010 Vertical Market Specialization by B2B Vendors Benchmarking Study. This webcast addresses the questions of how to find more clients, generate more revenue and build your business. Marketing expert, Laura Lowell, describes the methodology behind her uniquely simple THINK.PLAN.ACT. market development program. • Build relationships that provide new opportunities for referrals, passive income and growth. • Satisfy your clients and retain them (plus the pitfalls to avoid). 42 Rules webcasts offer practical advice from experts in their field. Almost anything in life can be summarized into 42 distinct ideas that capture the essence of the topic. Not every rule will work for everyone, but give it a try and you’ll be amazed at the big difference a few rules can make.